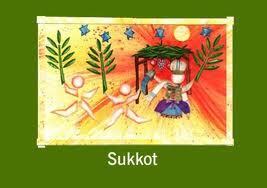 Sukkot is the Jewish harvest holiday. It starts in the Hebrew month of Tishrei, four days after Yom Kippur. In the western calendar it begins early fall and lasts for seven days. In 2015, Sukkot begins at sundown on September 27 ends October 4. It's also known as the Festival of Booths or Tabernacles. Based on a Biblical injunction, during Sukkot, Jews build outdoor huts called "sukkahs. They live, eat, pray and perform ceremonies using the "four species"--etrog (citron or lemon), lulav (palm fronds), willow twig (aravot) and myrtle twigs (hadassim). Here are free printable Sukkot lesson plans, Jewish activities to teach children about Hebrew holidays. Torah Tots is a good place to start for things Jewish for kids. It has free printable Succot activities, crafts, lesson plans, coloring pages, recipes, songs, prayers and Parsha (scripture) readings. Children will enjoy playing online games, too. Look for all Jewish holiday activities here. The fall ones include Rosh Hashanah, Yom Kippur, then Succot (another spelling), Shmini Atzeret, Simchat Torah and Chanukah. DLTK has free printable Jewish crafts for younger children based on general Hebrew themes. The Lookstein Center for Jewish Studies has a comprehensive list of free printable Sukkot lesson plans for older children. Chabad is another great resource for Jewish families. Here are free printable Sukkot coloring pages, prayers, recipes, games, crafts and activities. Tips for building a sukkah are included, as well as activities to explore Sukkot and other Hebrew holy days. Jewish Homeschool has a plethora of free Hebrew holiday printables, including some for Sukkot. There are homeschool helps, too. Judaism 101 has free printable Sukkot prayers and kaddish (blessings) to observe a proper festival.